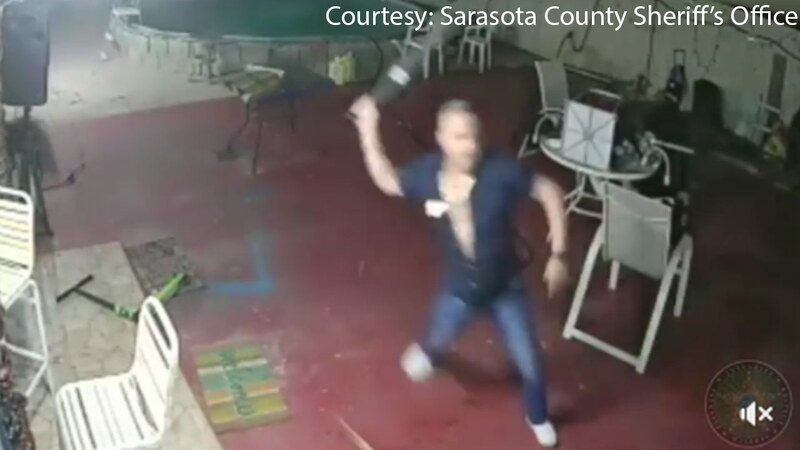 SARASOTA COUNTY, Fla. (WLS) -- A man in Sarasota County, Florida fought off would-be robbers with a machete, and the incident was captured by a surveillance camera. At about 4:45 a.m. Thursday, police received a report of a suspicious person armed with a rifle at a home in the 2100-block of Dodge Avenue in Sarasota. Police arrived and discovered the victim had disarmed the suspect and was holding the suspect for police. The victim told police more suspects were involved and police located a vehicle matching a description of the suspect's vehicle and four more suspects were apprehended. Police said surveillance video captured the entire incident, showing the suspects enter the home armed with a shotgun, machete and crowbar. The suspects attempted to rob the victim, but were seen fleeing while the victim armed himself with a machete. Five people were taken into custody and charged, police said. Alen Beltran-Vazquez was charged with two counts of armed robbery and possession of a firearm by a convicted felon. Ronier Jauregui-Lorente and Angel Cabrera-Basulto were each charged with two counts of armed robbery. Jorge Valido-Leyva and Roberto Salcedo-Balanza face two counts each of principal to armed robbery.